We have a very unique and super looking King Kong inspired t-shirt now available. Denham Productions of New York City nods a knowing head at Jack Black’s character and his persistent movie-making antics in the movie. So, want to go to Skull Island? 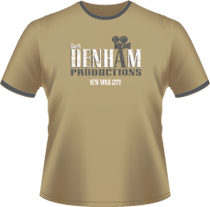 Maybe grabbing yourself one of these impressive t-shirts might get you a part in one of Carl Denham’s nect films. Produced on a Khaki, with Grey trim, premium cotton t-shirt and printed in a distressed white and colour-matching grey inks, it looks and feels like an eighth wonder of the world (well, maybe a little over-the-top there). We have a brand new, horror movie inspired t-shirt available. 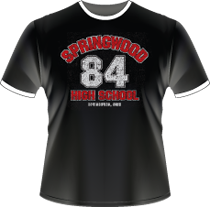 Springwood High School is inspired by A Nightmare on Elm Street, Wes Craven’s classic horror from 1984 (hence the 84 on our design). A classic style, we have gone one step better and produced it on a black premium t-shirt with white trim, giving it a nice college style. Distressed red and white print give it a retro-look that will last and last. Check it out at our online site HERE. Out now is our Braveheart inspired t-shirt. Super-cool distressed look with a red and white print. With the classic quote "Every man dies. 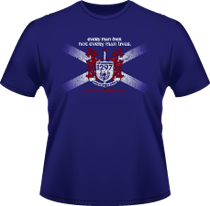 Not every man lives" subtley printed at the top of the design with 1297, Battle of Stirling Bridge as a heraldic design with the Scottish War of Independence along the bottom all brought together within the St. Andrews cross. Something for the patriotic Scot as well as fans of this excellent movie. Check it out now at Nerdoh.